Upon entering UK’s payment processing market, SumUp provided clients with a completely free card reading terminal. However, with the launch of their more advanced Bluetooth model the Air, they began charging £29 per reader. The new reader offers powerful features for businesses looking to take mobile payments, including accepting Apple Pay and other contactless payment wallets. The more sophisticated reader has allowed SumUp customers to offer more options to clients, leading to increased sales and an overall boost in client satisfaction. With MobileTerminals.net special visitor discount, you will receive £10 off the original price by following the link below. 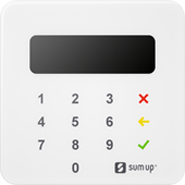 Simply register for SumUp and purchase the card reader to receive the discount when you go to checkout. The SumUp Air teams up with SumUp’s mobile application to provide users with mobile payment processing for their business, no matter where they are. One of the most popular mobile payment systems in the UK, SumUp offers clients a wide variety of services including store creation, in-depth transaction reporting and a variety of receipt options. One unique aspect of SumUp in comparison to other payment processors in the market today is that SumUp built their chip reading terminal and application 100% in house. By developing the hardware and software together within their own team, they avoided having to use 3rd party providers, allowing for seamless cohesion between the devices. If you are interested in learning more about what SumUp can offer your business, read our full SumUp review here. With an ever growing list of features available for clients, SumUp is always in contention for the top mobile payment processing system for small to medium-sized businesses in the UK. SumUp credit card machine is a reliable and trustworthy tool to solve the problem of payments and money handling in today’s digital world, especially for small and medium based companies.